A view of Lake Constance, with an extensive sky. The Rev. C. H. Townshend. Listed in the 1868 post-mortem register of the contents of Townshend's London house (V&A R/F MA/1/T1181) in the 'Fossil and Mineral room' as by Zimmermann; Bequeathed by Rev. Chauncey Hare Townshend, 1868. 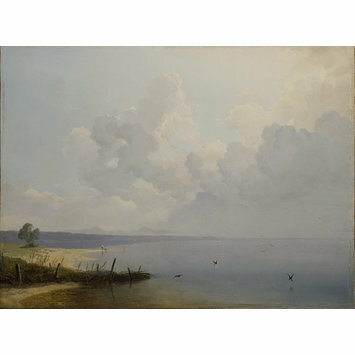 Historical significance: Zimmermann had a brilliant technique and excelled at light effects and spontaneous effects of nature. Lake Constance (German: Bodensee ) is on the Rhine at the northern foot of the Alps. The third largest lake in Central Europe, it has shores in Germany, Austria and Switzerland. This lakeside scene is almost devoid of incident, save for some hovering birds and two tiny figures at the left, middle distance. The emphasis upon the sky which is a marked feature of this work, seems to have been especially congenial to the Rev. 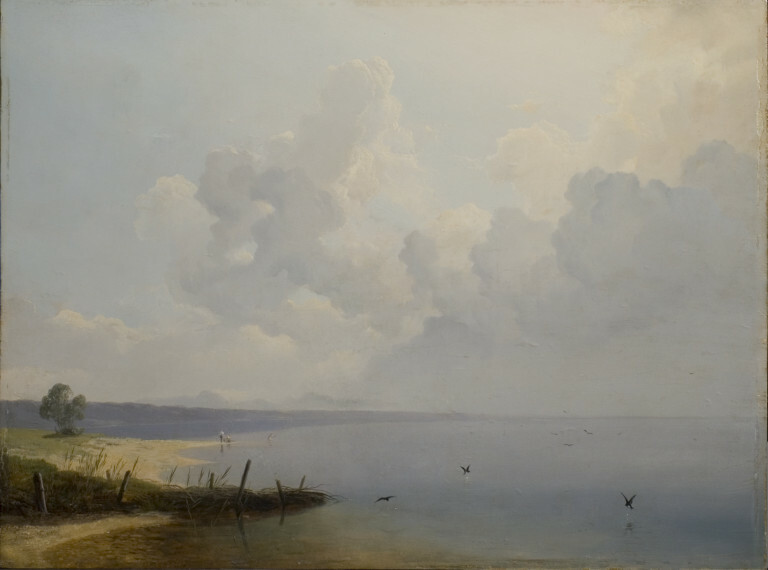 Chauncey Hare Townshend, who became a major early patron of landscape photography, and particuarly of the French photographer Gustave le Gray, who excelled in seascapes with extensive skies. Townshend owned a number of such photographs (V&A no.67.995, 67.997, 68.000-68.004). Kauffmann, C.M. Catalogue of Foreign Paintings, II. 1800-1900 . London: Victoria and Albert Museum, 1973, p. 105, cat. no. 231.